The academic team at UODA are taking initiatives to extend boundaries in the field of engineering. After diligent research and communication, UODA has created links with the Korean National University of Transportation. A Memorandum of Understanding was signed with the Korean National University of Transportation to promote student exchange, as well as academic exchange. The two Universities also agreed upon taking initiatives to have research collaboration between them in this field. Under this programme, the Presidents of the two Universities, Professor Mujib Khan of UODA and (insert name of Korean Uni President) of Korean National University of Transportation, visited each other’s institutions to strengthen the academic ties between the two Universities. 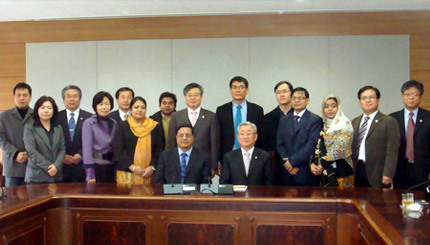 The photograph shows the President of UODA with his team at the Korean National University of Transportation.